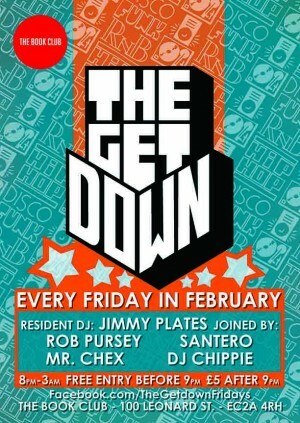 The Get Down returns to The Book Club basement every Friday, with resident and host Jimmy Plates joined at the helm by his weekly guests DJs and selectors. This is Block Party business so expect nothing more than the best urban sounds ranging from disco, funk and soul, to hip hop, trap, r'n'b and Afrocentric rhythms. The Get Down is the only weekly party in Shoreditch you need to know. So get to know! Music policy: R&B, hip hop, disco, funk, soul classics.